There are only 5 more episodes left The Vampire Diaries series and I can't even believe the way in which the series is going. If you haven't watched last week's episode Season 8 Episode 11 "You Made A Choice to Be Good," I demand you to please watch it because there was so much shock within watching that episode. I haven't been this shocked since....well I honestly can't even remember the last time TVD shocked me like this. 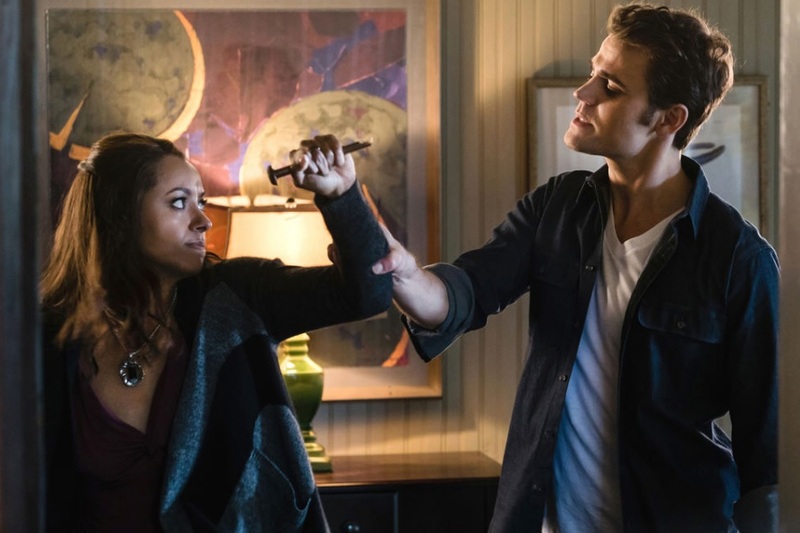 Let's jump into the 3 major things that happened last week on The Vampire Diaries. I honestly did not think that the unthinkable would happen. I was hoping that the writers would give Bonnie a break instead of having her lose someone else, but apparently they just don't care about Bonnie. Enzo gets his heart ripped out by Stefan as he attempts to kill Elena. I really had hope that Bonnie and Enzo would be able to live a happy life together, but that wasn't in the cards for them unfortunately. Bonnie's reaction hurt my entire existence. Her yelling out to Enzo as she stared at his desiccated vampire body made my eyes swelled with tears. I can't understand how or why the writers would constantly do this to her and put her through all of this heartache. However I do wonder what that witchy sound off was considering Bonnie hasn't been able to use magic. Could this mean that she has magic again? So yeah, Stefan is human now.... or so I think. After switched off Stefan killed Enzo and proceeded to enter the house to kill Bonnie to get to Elena, Bonnie stabs Stefan with some of Elena's vampire cure filled blood. I don't even know how to feel about this honestly. However it would make sense since the writers did say that there will be a wedding that will occur before the end of the series. I'm thinking Steroline will walk down the aisle, although I have another feeling that maybe Stefan becoming human could mean that there is hope for Stelena as well. This is heartbreaking every time man. Matt's heritage may prove that he is a vital part of destroying Cade. Matt just recently came across a Maxwell family heirloom and some cryptic messages left behind in an old diary. To a degree, Matt has always felt like he had no place in the supernatural world but it seems as though he may be the key within saving everyone. I honestly am just hoping he lives until the end and can be the protector of the town he loves so much. So what do you guys think will happen on the next episode of The Vampire Diaries? How do you guys feel about the death of Enzo or Stefan becoming a human? Leave a comment down below and let me know what you guys think.